Justice Betty Roberts has long been recognized in Oregon for her contribution to women in the profession. She has served in the Oregon House and Senate and in 1977 became the first female appellate judge in Oregon, when she was appointed to the Court of Appeals by Governor Bob Straub. 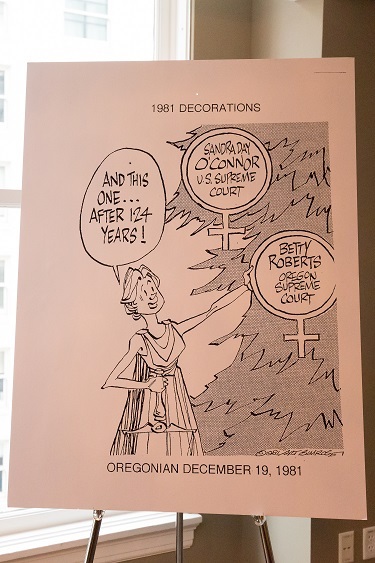 In 1982 she became the first woman to serve as a justice on the Oregon Supreme Court. On August 6, 2006, Roberts was recognized for her outstanding accomplishments when she received a Margaret Brent Women Lawyers of Achievement Award from the ABA Commission on Women at the Annual Meeting in Honolulu, Hawaii. The 2017 recipient of the Justice Betty Roberts Award is the Honorable Julie Frantz.